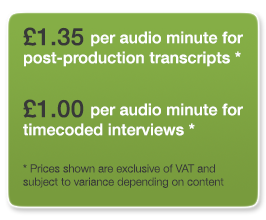 Since 2009 we have provided reliable, confidential transcription services to production houses across the UK. We prepare fully timecoded verbatim interview transcripts, to assist with the editing process, and post-production scripts for the completed shows prior to and post transmission on television. We consider the quality of our work second to none; it being regularly provided to the major national television channels, BBC, ITV, Sky, as well as numerous cable and satellite TV channels. Our rates are extremely competitive, and our client base supports our belief that we are now amongst the most trusted suppliers of transcription services in the UK. We are able to timecode documents using SMPTE timecode from all media formats.